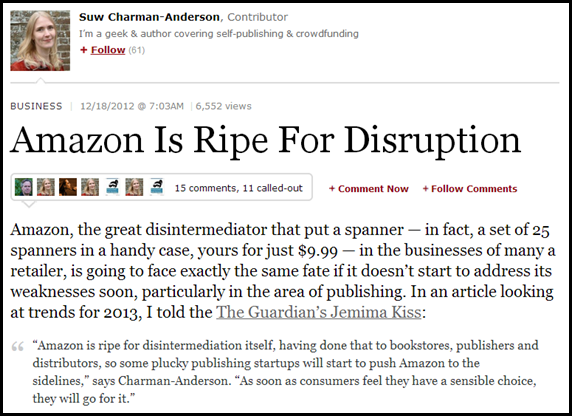 Suw Charman-Anderson, a UK self-published author and social media pioneer who also writes for Forbes occasionally, believes that Amazon is ripe for a fundamental disruption in its business model. Her article – linked above – describes her argument. I’ll summarize it, briefly. Amazon’s affiliate program is not the only option, and bloggers will shift to other programs or offer multiple links. Amazon currently has share, but no competitive moat. Amazon doesn’t provide enough data to book publishers so they can make informed marketing decisions. Publishers cannot forge a direct relationship with their customers (and they need to). Publishers can’t bundle books and ebooks through Amazon. Can Amazon be sure to maintain its dominant position purely through its catalogue, reach and discount? Is that really enough for keep it secure? I believe there are two major problems with this viewpoint. First, Amazon’s advantages are not limited to its catalogue, reach and discount; second, that the 3 problems Amazon has are disruptive. Conceiving of Amazon as an online version of WalMart (or ASDA) is a mistake. The core operating principle of Amazon – that I can see – is to lower the friction of each marginal purchase. Once you have an account on Amazon, each additional order becomes easier. If you buy enough things (say, one purchase a month) where an Amazon Prime subscription pays off, the friction lowers even more. And if you buy a Kindle, the friction for certain media drops further still – down to instant gratification. This is one of the reasons why Amazon has so strenuously defended its 1-Click patent: it regards the ease of purchase as a serious competitive advantage. And, while Amazon doesn’t kick data back to its suppliers, it uses every scrap of data it can get its hands on. If you have an Amazon account, and you visit Amazon to check out a product, Amazon will note that and then email you later with an offer. The time delay of the email, and the quantity of the emails, is – I’m confident guessing – variable on a per-person basis to maximize read-and-clickthrough rate. This is one of the smallest things Amazon does. In fact, I wouldn’t be surprised if the industry upset over how Amazon has been managing reviews has to do with Amazon choosing what reviews to feature / hide / etc based on how that maximizes conversion rates and minimizes returns. What seems to be random deletions and arbitrary rules is more likely to be Amazon being very aggressive about managing KPIs for conversion rates and customer satisfaction. The combination of Amazon’s near-obsessive focus on making marginal purchase decisions easy – i.e. their conversion rate – and their well-known focus on using data to make decisions means that Amazon does have a sustainable competitive advantage with their affiliate system. An independent website, seeking to monetize links to a retailer, will base their opinion on one primary thing: what makes them the most money. I would wager that the conversion rate from Amazon Affiliate links is much higher than the conversion rate from other links. Which means that (i) Amazon is likely the preferred affiliate link, and (ii) adding more affiliate links on a page will lead to a net decrease in revenue (if for no other reason that multiple links for the same thing decrease total clickthrough rate – the cognitive load of making a decision about which link to click on is more than most people care to exert). Unfortunately, I also don’t find Suw’s criticism of Amazon’s poor data-sharing habits. Oh, not that the data Amazon makes available is good – it’s not, if you want to have good ROI numbers for your marketing work – but publishers don’t care. They may complain about it – but for their entire existence, book publishers have sold through multiple channels. No brick and mortar bookstore kicks back sufficiently detailed information to know if customers purchased a book based on a TV ad, a Facebook ad, or a news article. I doubt they collect it themselves. Publishers, in other words, are not facing anything new. I imagine that’s why Suw’s solution is not for publishers to exert themselves such that Amazon sees the error of its ways. No: Suw’s solution is more radical. Think about this: These days, authors have to do a lot of their own promotional work. Contrary to popular belief, just chucking a book on Amazon doesn’t mean that it’s going to get found and bought. And that’s especially true for new entrants with no reviews, no or low sales, and a price below £2.49. You have to promote, and promote hard. Doesn’t matter if you’re self-published or an author with a traditional publishing house, at some point you have to reach out to your audience and say, “Here is where to buy my stuff”. That means you can choose where to send them. Will you link to Amazon, where your sale goes into a data black hole, or will you send them to your own webshop, or your publisher’s, where that information can be captured and you can provide a few little extras to keep your readers sweet? Why is this wrong? Because it’s all about the sales. Fundamentally, people – publishers or authors – can use detailed data to maximize profit. There are two ways to do this: increase revenue, or decrease costs. More detailed data allows them to spend marketing dollars where they have the highest ROI (increasing revenue), and it also allows them to identify losses more quickly – cutting off spend. But sales data does most of that. And, because book publishers have diversified sales channels, they can get a pretty good idea of what advertising channel has higher ROIs. They get rough geography, research reports can give them broad demographics (who shops where), etc. Could they use more data? Sure, everyone could. They could, for example, use it to identify customers who are most likely in a new book, and send them personalized emails. Except Amazon does that already. What’s the real benefit in doing that kind of personalized marketing work yourself, if your retail partners do it for your? You’re taking on extra cost, and unless you somehow extract more money from the chain – e.g., charging higher prices – it’s not worthwhile. I don’t know how much more information a major publisher gets out of Amazon, though I’m guessing it isn’t half as much as they’d get if they ran their own retail operations. And ecommerce is a problem that has been solved. There are plenty of off-the shelf-solutions for inventory tracking, sales, fulfilment (both digital and physical), the whole nine yards. There’s absolutely no innovation needed for publishers to start their own retail outlets online. They could get going tomorrow if they so chose. Apart from significantly underestimating the costs for running an ecommerce website, I’m not sure Suw understands that she’s making an argument for vertical integration (or that many publishers used to offer purchases through their own website, and some still do). It would be a significant industry shift. A publisher makes money by (i) identifying excellent books, and then (ii) selling those books everywhere they can. They only need a fraction of the books they select to be really successful, and they can lose money on the others (no judgment is going to be perfect). They can incentivize authors to publish with them by offering marketing campaigns, editing services, etc to improve the quality of the product. They can sign long-term deals (multiple years, books) in recognition that there are non-trivial setup costs for a name-brand author that will sell via name alone. It’s an entirely different arrangement from classic retail stores, who try to (i) identify great books after they are ready, and then (ii) make it easy to buy them. Indeed, you could argue – as Suw does – that “Amazon now risks exactly the same disintermediation that it perpetrated a decade ago.” Amazon would be ‘disintermediated’ from the sales process. Unfortunately, I don’t think Amazon did disintermediate anyone. Rather, Amazon disrupted the cost structure of traditional retail. There are two things to note: first, that a website has high upfront costs but low marginal costs with tiny increments. There’s a reason that Amazon was founded in 1994 and turned its first profit over 7 years later. In contrast, brick and mortar stores face a step function for growth. To open a new market, they need to create a new store which is a non-trivial expense. Additionally, their market was bounded by the geographic area within which people are comfortable travelling. Nor are stores cheap to maintain. You can buy from Amazon nearly anywhere. Not so with Barnes & Noble, Waterstones, etc. Second, that Amazon faces lower risk in carrying a title. Amazon ships a book out only after a customer pays for shipping costs; a brick & mortar store pays to bring the book to the store, first. Since Amazon can ship from any warehouse, it has less duplication. This means that Amazon can also offer a far larger catalog, and then limit what it presents to people based on sales. A traditional bookstore can only have a limited supply of books in stock. The disruption was away from having a physical store – a significant capital investment, both in real estate and inventory – and towards a virtual store, which doesn’t operate with the same limitations. Suw suggests no disruption in either cost or limitations, just a shifting of the existing cost structure – vertical integration, in other words. However, there’s no real reason to expect that a vertically integrated publisher would do better. Of course, Suw could be right. Some retailers have publishing arms – Barnes & Nobles owns Sterling Publishing Co; Amazon has Kindle Direct Publish, as well as a string of publishing brands (47North, AmazonCrossing, AmazonEncore, Thomas & Mercer, Montlake Romance, and Amazon’s Children Publishing). But those don’t seem to be to be major players – despite Sterling Publishing being around since 1949 (although Amazon Direct Publish could be …bad… for publishers, long-term. That’s a serious disruption play: publish first, then filter later. Publishers operate as gatekeepers; Amazon gets rid of the gatekeeper, just hides books that don’t sell). Suw Charman-Anderson has not, in my mind, predicted any market disruption. Worse, I think that the weaknesses Suw identified is more nitpicking than necessarily weaknesses – and even if they were, I see no reason why Amazon could not eliminate those weaknesses with a relatively minor effort. There’s nothing stopping Amazon from “solving” any of the issues Suw brings up except that Amazon doesn’t want to. Is its reasoning correct? Perhaps not – but when Amazon is operating by choice, and not an exogenous limitation, the possibility of disruption is slim indeed. Or: Leave it to an expert, because amateurs make mistakes. 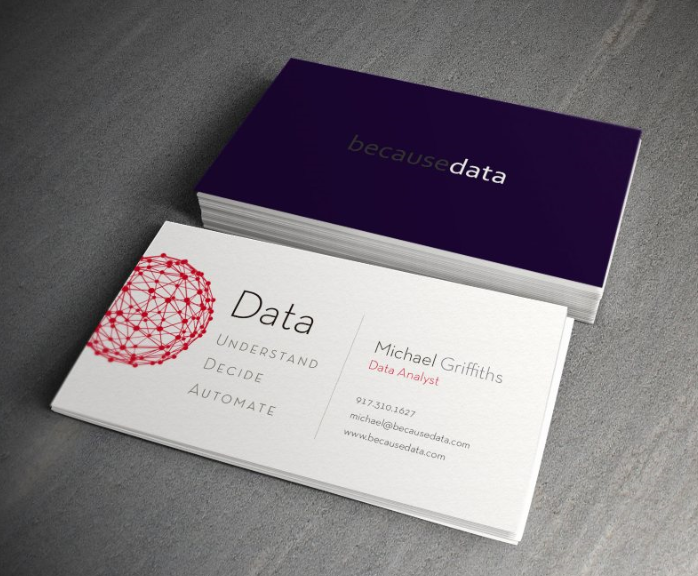 I’m formalizing a freelance business for data analysis. It’s part market research (what do companies need? what are companies currently doing? ), partly networking (can I get a job? ), and partly for revenue purposes (rent/student loans). I’ve been doing some freelance web development for some time, but I don’t think I’m enjoy a career in it. I like many of the technical components – and have gotten rather good at HTML/CSS/JS + PHP – but my original interest has always been in knowledge-building (my major in Epistemology, etc). 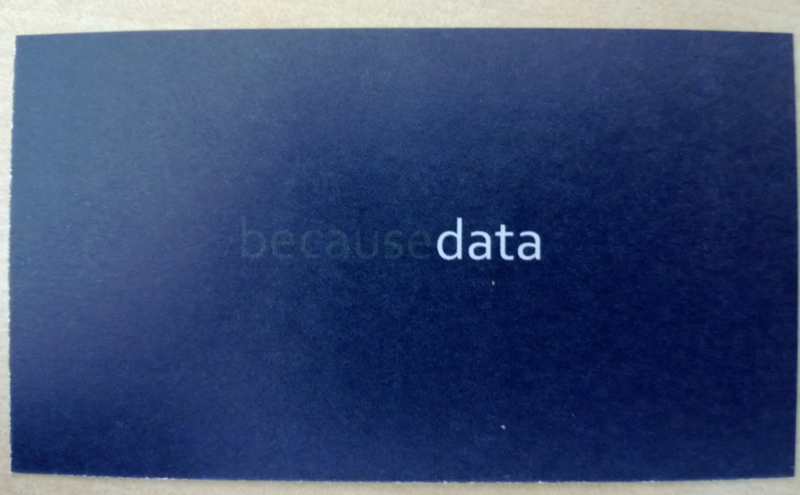 So: I did the first thing any self-respecting freelancer with too much time on their hands does – I designed a business card. Unfortunately, it seems that when I changed all of the colors from RGB mode to CMYK mode, I missed one. Which one? Yes, the back of the card has been rendered unreadable because there is no close CMYK match to the RGB color I used. While it was meant to match the website – not yet finished – instead it’s an unreadable mess. Is there a lesson to this? Probably: experts matter, because they can catch mistakes; printing is hard; and you should test multiple times in small batches before committing a large order. All things I thought I knew. Just not well enough, apparently. Labor is an asset, but it’s different in kind to most asset classes. I’m currently in the job market. I’m not (yet) looking very hard – I make some money doing freelance web development, and am involved with a couple of companies part-time doing data analysis, which means I make enough money to get by. The downside, of course, is that it makes me lazy. However, it’s caused me to think about “clearing the labor market” in a somewhat different way. Typically, I tend to fall back to an economic-centric way of looking at things. Companies have a set of things that need to be done; some known to the company, some unknown. Hiring talent (labor) to perform those duties is a matter of evaluating whether the candidate can perform the known tasks well, and ideally add value by identifying unknown tasks that add additional value to the company. Each candidate is willing to accept a salary range, where the range maps to a fixed quality of life score for the candidate (e.g. a candidate may accept a lower salary if they prefer the work, or it has fewer hours, less travel, etc). It’s neat, simple, and – for me – entirely misses the point. While I’m not looking hard for a position, that mainly boils down to not actively applying to many jobs (a couple a week? Less?) as opposed to not looking at options. I receive targeted emails from a few websites (e.g. Indeed.com) as well as recruiters who randomly email me or message me on LinkedIn. I find it quite astonishing that so few positions seem to appeal to me. And then I realize why. I’m not looking for a job, per se – I’m looking for the opportunity to apply, and develop, my skillset and knowledgebase. I’ve been relatively active at expanding my skillset, and it’s something I’m very interested in developing further in a few targeted ways. Specifically, I want to use statistical programming languages (e.g. R) to analyze diverse data sets (normalize, explore, hypothesis testing, etc.) and create a narrative to explain the data and influence decision-making in the right direction (report writing, presentations), and then automating that analysis where possible (using Python, C#, etc) and/or creating web-based dashboards and tools. Ideally, I’d use a sizable fraction of my (targeted) skillset. I’ve developed the skeleton for this skillset over time, such that a moderate investment would really allow me to flesh out those skills and become something of an expert. Unfortunately, figuring out where I can do this is I damnably difficult. I know, I know, the answer is informational interviewing and meeting up with people in various fields. Most jobs aren’t posted online, particularly the good ones. Or so I’ve been told. The jobs that I do see online, that I read through in my email every day, are written exclusively from the standpoint of current skills and previous experience. What it doesn’t tell you is anything about the opportunities for development. Sure, I get the rationale that companies are interested in what candidates can do for them. I even understand it from the perspective that, once the candidate pool has been thinned down, the company and the candidates can discuss career/personal development more directly, since that’s likely to be more specific to the candidate. And hey, I also understand that this is a bad time – candidates are a-plenty, so companies have less incentive to outline what they can offer candidates, since there are plenty of good candidates without going to the extra step of formulating the benefits to the candidate of the company. I hear – from people hiring – that good candidates are damnably difficult to find. Yes, it’s quite possible – probable – that in response to increased labor availability, companies increased hiring requirements and lowered compensation to thin the flood of applications. I’m simply of the opinion that the best people to have around are those who want to push their boundaries. To learn more; to become more capable; to have a greater impact on the company. All of these job descriptions seem, implicitly, to want someone who is currently capable of the job and no more. Who can step in, fulfill the tasks outlined by the company, and very little else. Perhaps even people who are less interested in developing themselves, and more interested in getting the job and getting out. After all, turnover is expensive, and if you can find someone who can do their job well and stay for an extended period of time, you save money. Sort of. The difference between labor and other asset classes is that labor is changeable, and appreciates in value over time (usually). For each worker, there is an opportunity cost for taking a job below his/her skillset, failing to develop skills, etc. The difference for the company is that a known resource – capable of a fixed amount – will never outperform. [T]here are known knowns; there are things we know that we know. There are known unknowns; that is to say there are things that, we now know we don’t know. But there are also unknown unknowns – there are things we do not know we don’t know. A company hiring a known resource will fulfill the known knowns very well. They can also hire – with much more difficulty – in an effort to deal with known unknowns (“We don’t have someone capable of fixing this old Fortran code? Then find someone who can!”). But a company is limited to its current resources to identify, and deal with, unknown unknowns – the most dangerous form, and potentially lucrative, form. Hiring candidates who will continue to develop over some time period (say three years) seem, to me, to be much more likely to identify the difficult problems – unknown unknowns. I’d prefer to see job descriptions that provide a list of requirements, and then outline the areas where a candidate would be expected to improve – or, listing the areas where significant improvement in an employee would have disproportionate effects for the company, for that position. I mean, an employee can invest in all sorts of skills that have limited returns to a company’s bottom line (office politics, anyone? ); for a given company, and a given position, the number of areas of improvement with a significant potential impact is likely to be quite small. Oh well. At the bottom line, this is just all wishful thinking – stuff that would make my life easier, by displacing work from me to companies seeking to hire employees. Still, it would be nice. Reading these job descriptions becomes terribly banal after a while.